Modern architectural styling frames with an integrated LED source and circular etched opal glass. For increased design options, fixtures can be installed horizontally or vertically. Frame bath and vanity fixture provides beautiful and continuous illumination, as well as energy saving benefits. 3000K, 90+ CRI. The Heart Collection possesses a smart simplicity to complement today's home. Etched glass shades add distinction and provide pleasing illumination to any room. Versatile design permits installation of fixture facing either upwards or downwards. 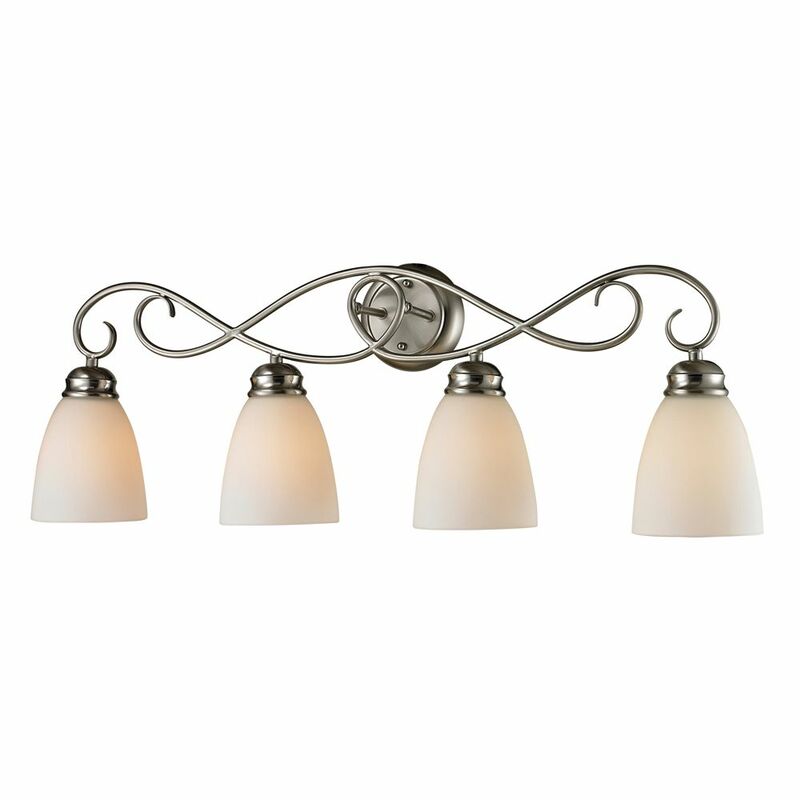 Chatham 4-Light Brushed Nickel Bath Light Add instant style to your bathroom with this beautiful vanity light. Finished in brushed nickel with beautiful white glass shades. Chatham 4-Light Brushed Nickel Bath Light is rated 3.5 out of 5 by 2. Rated 5 out of 5 by Itzybitzy from A little difficult to hang, but looks great in my newly remodeled master bath. A little difficult to hang, but looks great in my newly remodeled master bath. Rated 2 out of 5 by Bobbi from Not what the picture shows The picture shows the lights going down. When I got the light, I hired someone to put it up, and the only way he could do it was to hang it the other way, so the globes were up. The glass globes wouldn't stay if it was hung the other way. I left it up, as I need the light, but now I have to get another light, hire someone to take this one down, and put the other one up. I love the light, but as much as I try to like it, it just looks like it is upside down. Now, I have to figure out how to return it, so I can get my money back, so I can order a new one.